What to do when IKEA comes to town... and even if it doesn’t. There’s been a lot of talk lately about the “threat” to traditional retailers when competitors like IKEA arrive in a local market. Maybe it’s time to find the opportunity hidden within the problem, or to recognize that the real threat comes from within. So IKEA just announced it’s coming to your town next Fall. Great, just enough time to plan your “Going Out of Business Sale”. Hey, with the soft economy and your shrinking margins, the opening of a 400,000 square-foot IKEA store should just about sound the death knell on your business future, right? Well, if you believe that, then you might as well go back to sleep with the rest of the furniture industry. This is just a bad dream and it’ll all be gone when you wake up. Unfortunately, so will your business. There’s a lot of blame being heaped on low cost imports and the expansion of big chain retailers like IKEA as the reason for the decline of the independent retailer. Well, let’s do some root-cause analysis; it’s NOT the bigger, chain-store competitors that are putting smaller retailers out of business, it’s their customers that are doing that. They are voting with their feet and flocking to the alternative retail models that have emerged during the last two decades; models that embrace and engage consumers and their lifestyles. During that same time period, the traditional retailing model has barely changed. It’s out of date, undifferentiated, often insulting, and generally unappealing to today’s more savvy consumers. It’s true, many things change in a market when IKEA comes to town. Fortunately, most of these things can be leveraged by in-place retailers for their own benefit. For starters, the affected market quickly becomes a destination for furniture shoppers with a commensurate increase in traffic flow. Who doesn’t want more potential customers driving through their zip code? Also, IKEA’s consumer-focused approach illuminates the general weaknesses in the traditional retailing model. The result is that both the consumer and industry become more sophisticated: The former by choice, the latter by necessity. An astute and progressive retailer can take advantage of this. Consumer interest in the furniture and furnishings category grows, as does their thirst for knowledge. Their tastes evolve and demand for quality and service also increases. IKEA has both driven and embraced this evolution of the consumer. So can the average retailer. OK, how does a retailer know what to do first: Tweak an existing business model or overhaul the whole operation? That depends... the industry is rife with consumer insults: Fictitious sales promotions, insane terms, unbelievable guarantees, high-pressure sales people, and cramped showrooms. Few consumers value (or believe) any of these things any more. A business that relies on any of the aforementioned tactics will likely need a major overhaul to survive. You don’t need to compete head-to-head with IKEA to win. IKEA typically achieves about a 15% market share once it establishes itself in a market. The remaining retailers only need to carve out their share of the other 85% of the furniture marketplace. And let’s face it, IKEA’s products still represent a niche; customers who appreciate contemporary European design, modest quality and don’t mind self-assembly. That leaves many segment niches to serve and potentially dominate. Eliminate The Bull: Salespeople need to be retrained to sell based on what the customer is looking for: Real value at a low price point. Make Sales Promotions Believable: Everyday low prices should be complemented with periodic and believable sales on selected merchandise. “50% Off Everything In The Store”...no one believes that anymore, you just damage your credibility by pretending it’s real. Be Transparent With Terms: If you ever want a recommendation or repeat customer, you must explain the details behind the terms, particularly when there’s a big potential liability for the consumer. If you’re making more money off of the terms than the product, you’re in the wrong business. 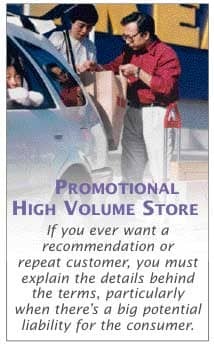 Communication Strategy: Promote your ability to meet a wide range of customer needs when it comes to lifestyle choices. Emphasize the consistency of product quality at a fair price. In-Store Layout: Create open space...people; particularly female shoppers prefer wide aisles. Enable the consumer to visualize the products in their own homes. Identify the Customer’s Needs First: Train your salespeople to listen and probe to quickly learn the customer’s real needs. You have the breadth of selection to meet a wide range of lifestyle requirements. Getting the customer and salesperson on the same page builds trust in the salesperson’s recommendations. Educate your sales team: This is your competitive advantage. Your salespeople should not only know their products but everything else in the marketplace... and know this better than your competitors know their own products. Communication: Focus your message on the “promise” that there’s no reason to go anywhere else, you have this area covered better than the competition and you‘ll use your superior knowledge to prove it. Customer Targeting: Limit your marketing to people who both appreciate your product quality and services and can afford it. It sounds obvious, but there are still a lot of high-end retailers using mass marketing as their primary communication strategy. Communication Strategy: Stress the in-store experience and in- home satisfaction in your messaging. Build a brand promise that communicates both and use it consistently. In-Store Experience: Blow away the customer’s expectations with personalized service, an understanding of the customer’s needs, product knowledge, and an attention to detail that would put even the best wedding planning to shame. In-Home Satisfaction: For this segment of the market, it should be unparalleled delight. Promise it, deliver it, and validate it. Don’t promote and sell on price. Every retailer can identify a more compelling reason to exist. Even discounters shouldn’t make price their primary message strategy. For example, focus on how low prices enable the customer to live their desired lifestyle; price is merely a means to an end. Value your customer for the long run. Leverage past customers by maintaining an ongoing relationship with them. Customer Relationship Management (CRM) is really about maintaining a meaningful connection so that when the next purchase opportunity arises, you’re top of mind. Encourage word-of-mouth. Find ways to encourage your loyal customers to recommend you to their friends. Hint: Rewards are insignificant compared to the profit from a new bedroom or dining room set. Identify your competitive advantage and leverage it. Communicate your Brand Promise and deliver on it. Lead, don’t follow. The other guy probably doesn’t know where he’s going anyway. What do all of these approaches have in common? They all require retailers to look at their businesses through the eyes of their customer and to act accordingly in order to create the ideal shopping experience for their respective target customer segments. Despite the closures of many long-standing traditional retailers, some in-place retailers have managed to not only survive, but also thrive by taking advantage of the new retailing landscape thrust upon them. They’ve done it by shifting from a price-driven “push” sales and marketing model to one that recognizes that furniture is really an integral part of the consumers’ lifestyle; one that enables the consumer to live a better life. There’s a lot of room in the industry and there will be many winners; and there will be many losers. IKEA will be one of the winners. Why? Because IKEA has transformed furniture shopping into a unique experience that their customers won’t find anywhere else, and made the IKEA Brand something they can’t live without. The critical point is that it’s NOT about IKEA. It’s about your business, your brand, and your consumers. Your actions should not be dependent on the presence or absence of IKEA. The real opportunity is in finding a way to remain relevant to the consumer. The real threat is in doing nothing. You need to act now. You must build a brand and create a brand experience that’s both unique to you and irresistible to your target customers. People will always need furniture. The question is whether they will always need YOU. For that you will need to become an essential part of their life. It’s not an option. Your survival depends on it. Start by defining your vision and mission. It should be ambitious. It should justify your reason and right to exist. All great brands have this in common. You’ve probably heard IKEA’s vision a million times: “To create a better everyday life for the many people”. Pursuing your vision is a never-ending quest. Continually striving to achieve it is what makes an organization great and keeps it there in the minds of its customers and employees. So quick, what’s your vision? What greater good can you provide? If you have to stop and think about it for more than five seconds, then this is definitely where you need to start. Define your positioning and strategy. How will you win? To accomplish this you’ll need to cultivate a deep understanding of the consumer and your competitors. Where are the opportunities? Which ones can you own? Knowing this might require some market research – probably followed by some more research to answer all of the questions raised by the first piece of research. Whatever it takes. A false step here guarantees extinction. 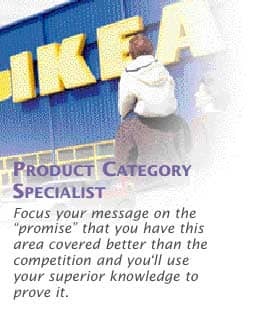 Address your product offering. Align it with your target customer’s lifestyle and provide a range of products that will motivate them to buy. Extend and refresh the offering periodically with items that build on the past assortment in a way that keeps the customer coming back for more. Determine your sales and distribution strategy. This is likely the most difficult issue for the independent retailer. It’s not just a question of whether you should add an online presence to your brick and mortar locations; or a question of commissioned versus non-commissioned sales staff. This is the point in your interaction with the consumer where you begin to deliver (or not) on your brand’s promise. It’s critical that your selling and merchandising strategies support that promise. Execution. It all comes down to this: Communicate and stand behind your brand promise, both internally and externally. A well-constructed marketing and communication plan will deliver your message to the right people at the right time and motivate them to act. If the interaction with the consumer is consistent with your brand promise, then you’ll begin to build long-lasting customer loyalty that can make your brand an integral part of their lives. What About This IKEA Threat? In reality, if IKEA isn’t already in your market, the odds are that they’ll never be there. Let’s look at the chessboard. There are 210 DMAs (Dominant Market Areas) in the United States. IKEA is currently in 28 of these markets. That leaves 182 non-IKEA markets. Of those, only about 2 or 3 dozen would sustain IKEA’s business model - a successful model from which they’re unlikely to diverge. So IKEA may never show up in your town after all. Of course that would be a shame for your business, because the benefits of having IKEA in a market far outweigh the negatives. Just remember, regardless of whether IKEA ever shows up in your market, your actions should be the same. Evolve and thrive. Steen Kanter, former CEO of Ikea U.S. East and the Body Shop, is the CEO and Chief Business Consultant at Kanter International, a business and brand building firm dedicated to growing successful companies into category dominators. Joe Herget is Kanter International’s Senior Vice President of Strategy. Joe developed his expertise in business strategy and brand building at world-class companies including Campbell’s Soup, Dannon, Evian, Michelin and Nabisco. Steen founded Kanter International in Philadelphia, Pennsylvania in 1998 along with company President, Daniel Erlbaum. Since launching the firm, Kanter International has helped numerous companies ranging from emerging to mature corporations build their profitability and brand equity hand-in-hand based on a unique blend of business consultation, research-based strategy and marketing services. Current and emerging success stories include Daffy’s, Lord & Taylor, Everlast Worldwide, Herman Miller, Joseph Abboud, Mohawk Industries, Guitar Center, China Grill Management, Triple Five Soul and Jonathan Adler, just to name a few. Questions about this article or on retail branding and marketing can be directed to Mr. Kanter at steenkanter@furninfo.com.